Gabby Slome is the co-founder and chief experience officer of Ollie, a tech-enabled brand delivering freshly cooked, human-grade food tailored to each dog’s nutritional needs. With a lifelong passion for animals, Slome founded Ollie out of a need to make and deliver healthier dog food and has revolutionized the $30 billion pet food industry by transforming the way we feed our pets.Slome is responsible for driving Ollie’s brand value and business growth by developing customer-led experiences across all channels with a focus on retention and acquisition. With a background in canine nutrition, Slome also leads product development, ensuring food quality and safety in a newly evolving industry.Prior to Ollie, Slome served as an Entrepreneur in Residence at Primary Ventures. 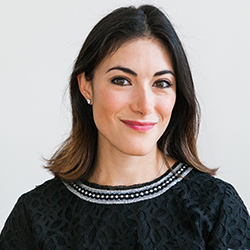 Slome has also held executive roles at Vente-Privée U.S.A. and Primary.comSlome lives in New York City with her husband, daughter, and rescue dog Pancho.